When you are preparing to buy a new sedan, you may have high expectations that your new car will deliver in the areas of comfort, style, performance and safety. With your lofty expectations in mind, it makes sense to take a closer look at what the 2018 Nissan Altima offers. As is the case with last year's model, the new Altima this year has a stunningly sporty look that may turn heads as you cruise through town. The style is unchanged from last year, and buyers will be able to select from six distinguished color options. The primary features that are new for the 2018 Altima are located inside the cabin. 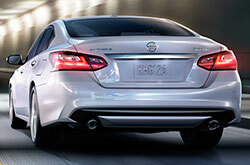 Each of the six trim levels for the Altima are loaded with adaptive cruise control. They also come with a standard forward collision warning system and an automated braking function. If you are interested in buying the most sophisticated trim level available for 2018, you will also enjoy smartphone pairing and integration functionality. Before you can buy your new Altima, you will need to learn more about the six trim levels available in 2018. The 3.5 SL trim is the highest option available. In descending order, other trim levels include the 2.5 SV, the SR Midnight Edition and the SR Special Edition. You will then find the 2.5 SR and the 2.5 S as alternative options. Higher-end trims have leather seating as a standard material, and all vehicles are available with two interior color choices. 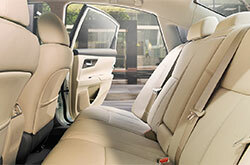 The stylish interior is enhanced by a full range of comfort and convenience features to improve your driving experience. A few of these features include keyless ignition and hands-free entry, a leather-wrapped steering wheel with cruise control buttons on it, power adjustments for the driver's seat, a sound system, heated side mirrors and illuminated vanity mirrors. 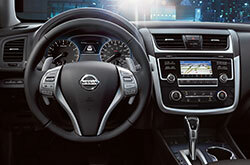 You can explore these and other interior features in detail when you take the Altima out for a test drive. Maneuverability and power are also important factors to weigh when you are searching for the right sedan to buy this year. There are two standard engine models available depending on the trim level that you purchase. The most upgraded trim level available comes with a 3.5-liter engine. The other trim levels are equipped with a four-cylinder, 2.5-liter CVT engine. This engine gives you 177 ft.-pounds of torque and 179 horsepower. These vehicles boast rapid acceleration and great handling. A few other related features that you will benefit from in the 2018 Altima are a variable continuous automatic transmission, an impressive turning circle and controls for stability and traction on the road. These incredible safety test results were enabled in part by the many safety features loaded into the Altima. Each trim level has similar safety features to help you drive with confidence. 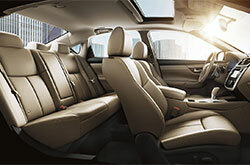 A few of the many safety features in your new Altima include child safety locks and rear seat anchors, airbags and headrests throughout the cabin, blind spot detection, pre-collision warning functionality, a remote anti-theft alarm system, ventilated disc brakes, engine immobilization and auto delay off headlights with a daytime running function. Come Explore the style and performance of the 2018 Nissan Altima. Call or visit Reliable Nissan in Albuquerque to learn more and test drive a Nissan Altima today!